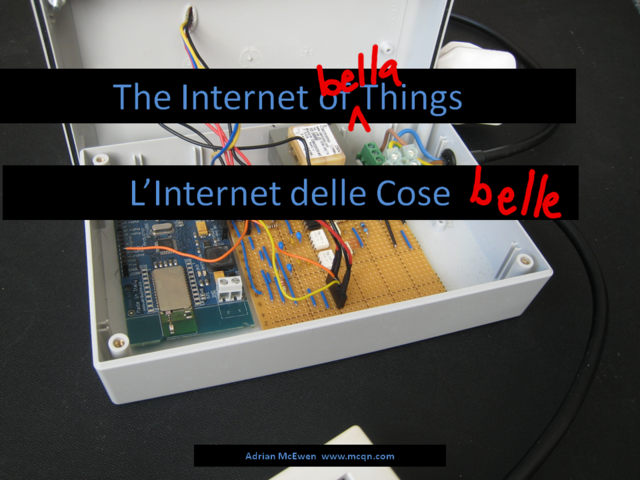 Last week, I was invited by the nice people at CREATE-NET to speak at the First Italian Internet of Things Day event that they held in Trento. It was the first time I'd visited Italy since I lived in Turin in 2008, and it was lovely to go back, if an all-too-short trip. 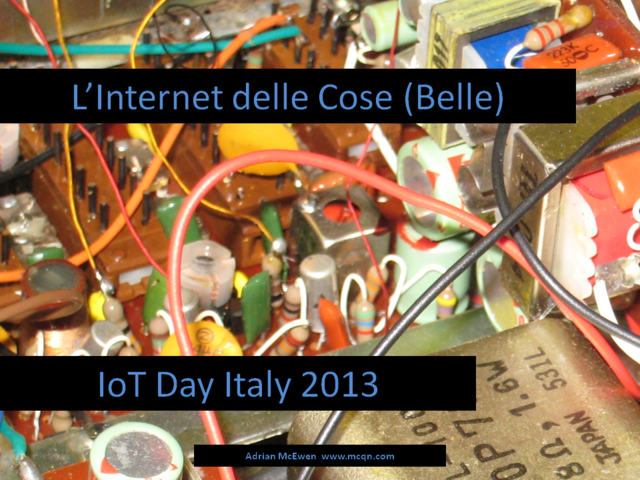 There was an interesting mix of attendees and discusions, and some good debate following on from my talk about whether Europe, and Italy in particular, with its long history of design and networks of small and creative manufacturers could leverage that to lead the way in the Internet of Things. I think there's a real opportunity there, and would love to discuss it further. 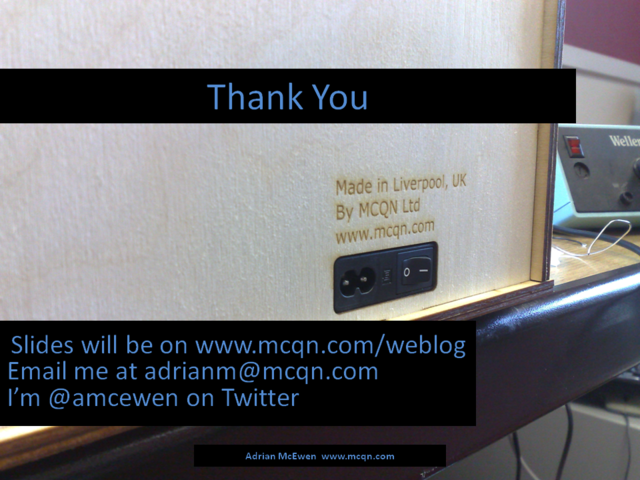 I'm Adrian McEwen. 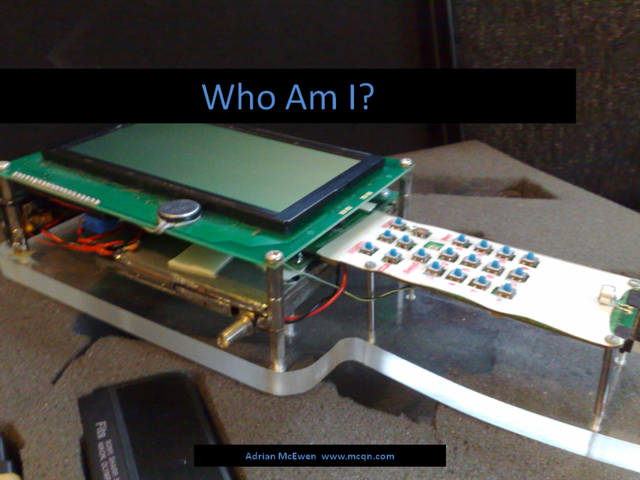 I've been adding the Internet to things other than computers since 1995. Initially cash registers, then PDAs and mobile phones - that picture is a mobile phone dev board which ran the first web browser to run on a mobile phone, back in 1997. Since 2008 I've been playing around with even lower end hardware, in the form of Arduino boards, and run MCQN Ltd., an Internet of Things consultancy (for want of a better word) and these days I'm in charge of the Ethernet library for Arduino. 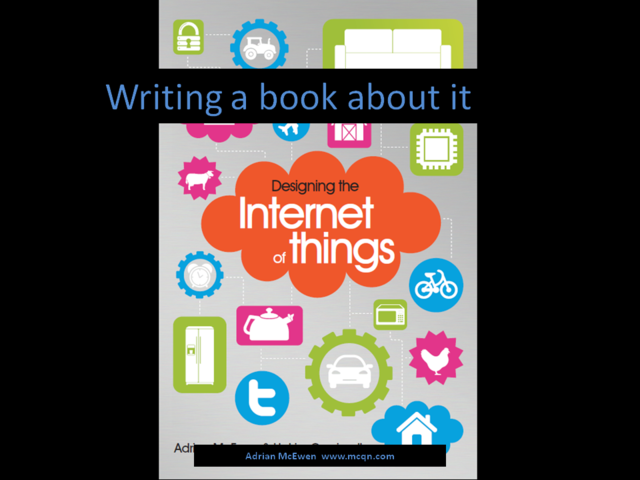 And I'm writing a book on the Internet of Things, which will be out later this year. 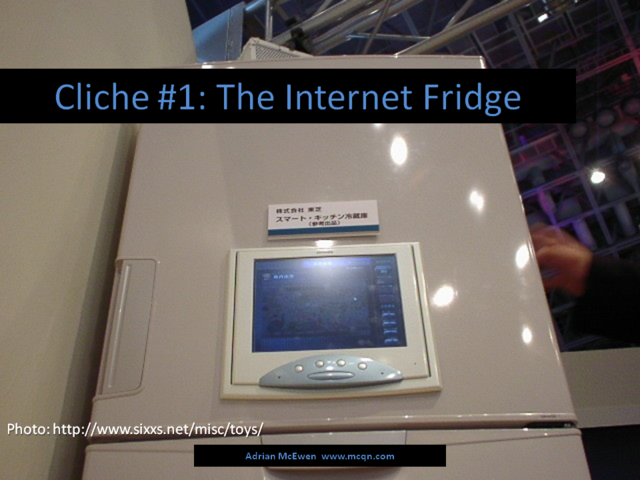 ...we get things like the Internet Fridge, which will automatically reorder food for you, and choose what you're going to eat based on the expiry date of the contents. 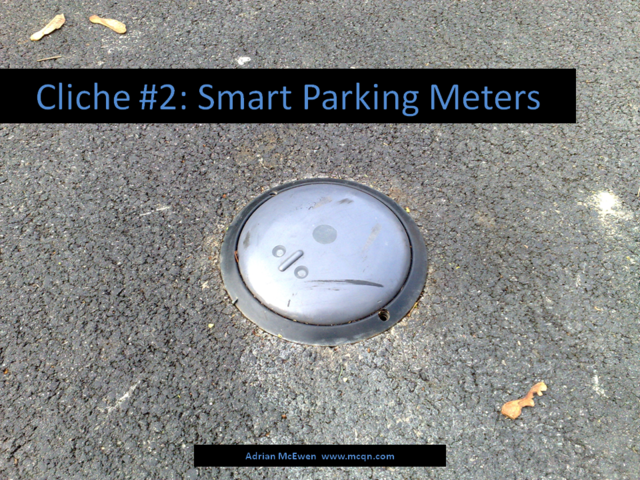 Or smart cities with parking meters which will make sure the city never misses out on a cent of parking fees. 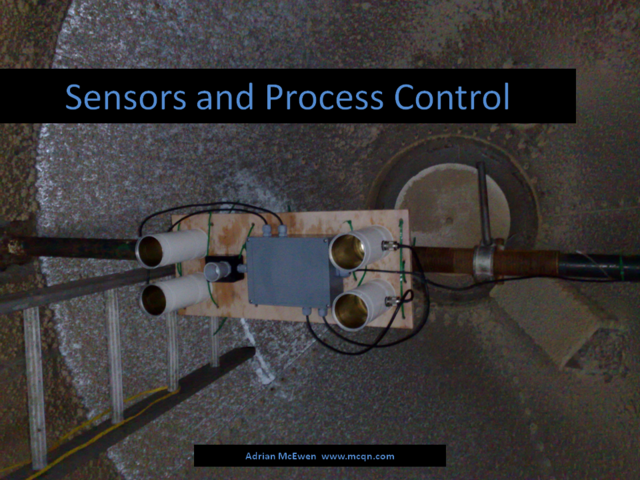 It is a very top-down, controlling view of how we might want this technology to help us. I want to present an alternative vision of the future. And as I'm speaking here in Italy, I want to steal an Italian term for it. When I came to live in Turin a few years ago, one of the guidebooks was explaining the term bella. The straight translation to English is beautiful, but according to the guidebook that didn't capture the true meaning - in English, beautiful is just about the appearance of the object, whereas bella also captures some of the integrity and inner goodness of what is described. Our devices should still be beautiful in how they look and work. 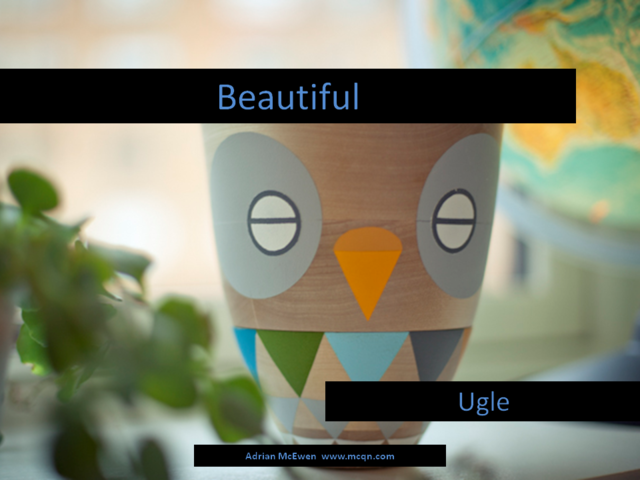 This is Ugle, from Voyoslo. It's a lovely turned wooden owl, which you control remotely via an iPhone app. The users decide what the colours mean to them, so maybe blue is "I'm heading home" and green is "ring me when you get chance"
The Internet of Things needs to be open. 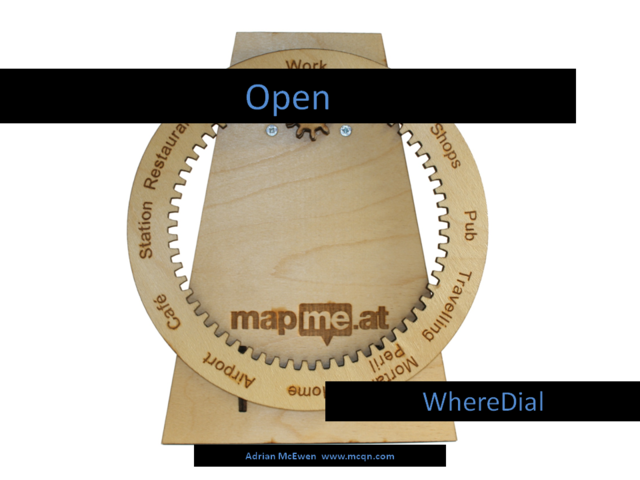 Fully open hardware (such as the WhereDial pictured here) lets us build on each others work to make better objects, but at the very least we should be building open APIs and protocols for the IoT devices and services to interoperate and work together. The Internet was successful not because it is neatly controlled from one central location, but because it isn't — it is a collection of services and machines following the maxim of small pieces, loosely joined. 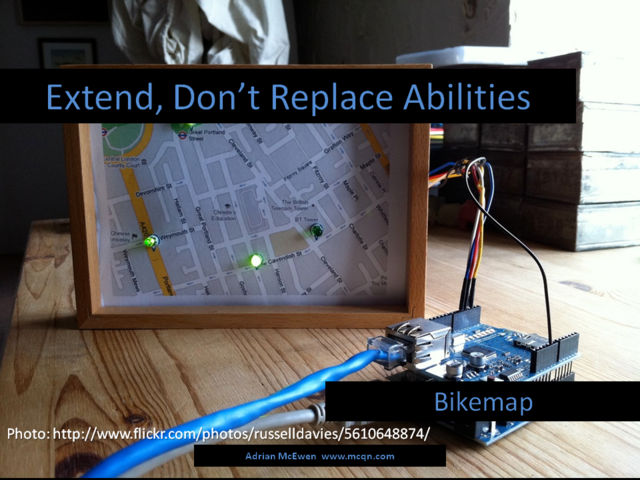 This is Russell Davies' Bikemap. It shows which Boris bike stations near his flat have bikes available, so he just glances at it on his way out of the door. It doesn't tie into his calendar to guess where he's going and just direct him to the "right" bike station, it just extends his senses to give him more information to decide what to do. If he wants to get a coffee from his favourite cafe, and the bike station next to it might not have any bikes he can still do that, without having to worry about a device continually trying to direct him elsewhere. Build better tools for humans to use, rather than building systems to replace the humans. 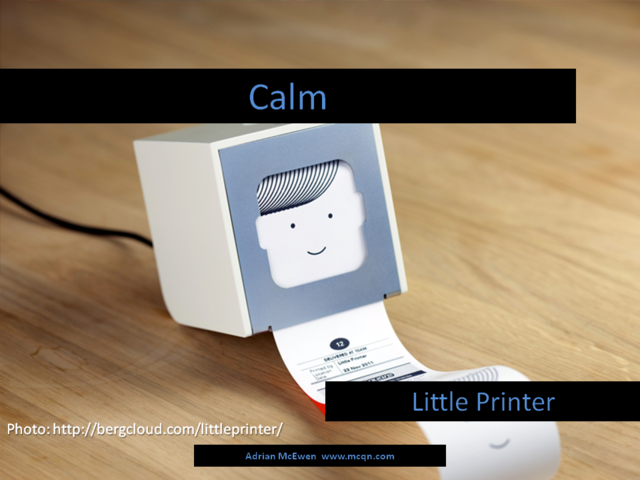 This is the Little Printer, from BERG. It's a gorgeously designed device that can print off things that would be useful when printed on something the size of a receipt. However, when you aren't interacting with it directly it sits quietly, not intruding on whatever else you're up to. Even when there's something to print it is very quiet about attracting your attention. A small white light pulses softly on the top. 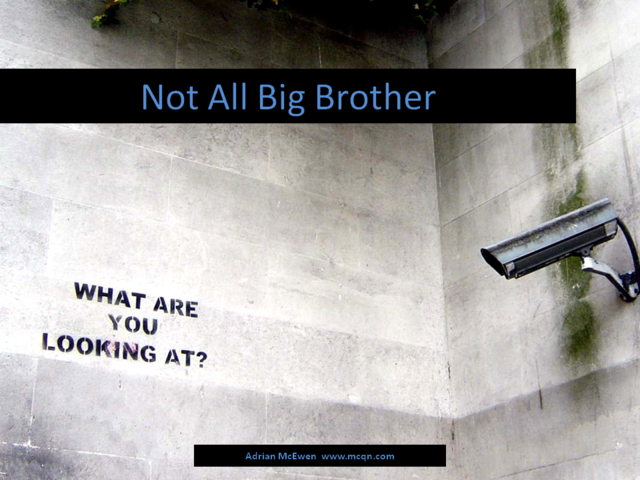 That's what we should aim for — if the Internet of Things causes the proliferation of devices that is predicted, I don't want my life to be full of little boxes all beeping and flashing to try to get my attention. 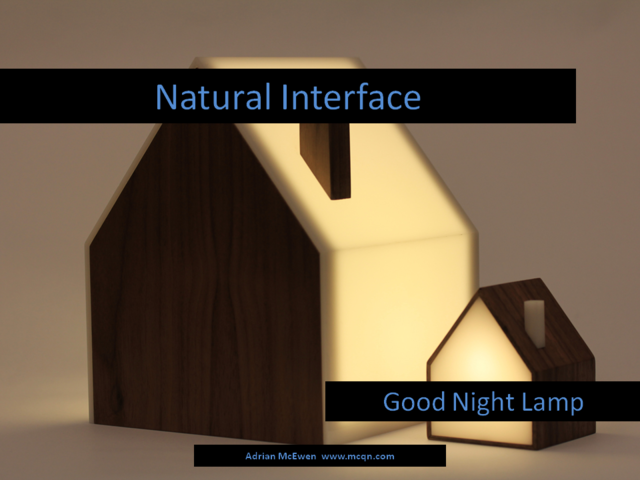 The Good Night Lamp takes the idea of integrating the technology into your life one step further. When you turn the Big Lamp on, the associated Little Lamp will also turn on, wherever it is in the world — which lets you stay in touch with loved ones more easily. 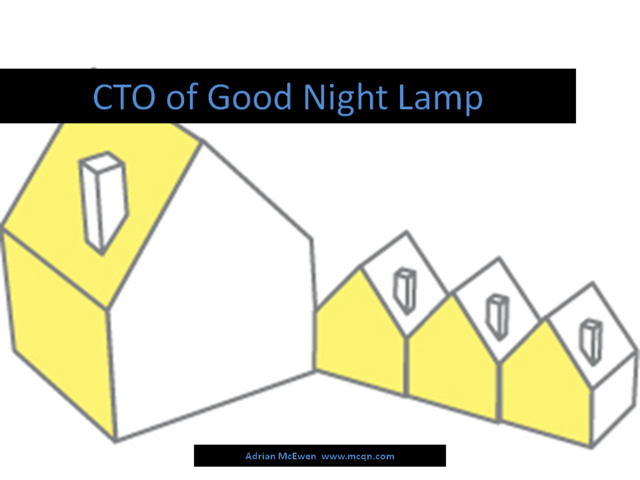 And the reason the Big Lamp is larger is because it's also a functioning lamp. You don't have to think about whether or not to send a message to your mum, or husband, or whoever has the Little Lamp, you just turn it on because it's dark and you need some light. Finally, just because IoT devices run with less processing power and a more limited interface doesn't mean that they have to interact with the Web through some intermediate service. Our experience with the mobile Internet and WAP has shown us that devices only gain widespread adoption when they talk directly to the servers on the web without being hidden behind some proxy. It's a bit harder to build, but far from impossible. 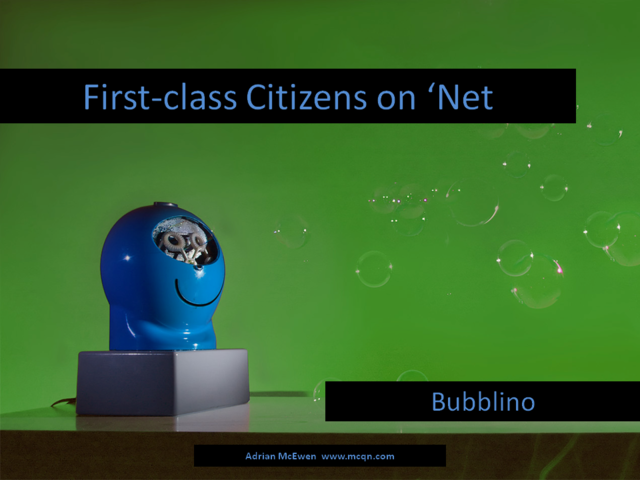 Bubblino was built back in 2008 and downloads Atom feeds directly, just like any RSS reader on a PC would.